Let’s face it - there is no person in the world that wouldn’t like a home with a swimming pool. Basically, pools are loved by everyone - from the youngest ones to the oldest ones. The fact that everyone can enjoy swimming in a pool in the summer time is the main appeal here. However, constructing a swimming pool is not an easy task if your home doesn’t have one. Still, with the right Sacramento pool contractor, the entire process can be effortless. 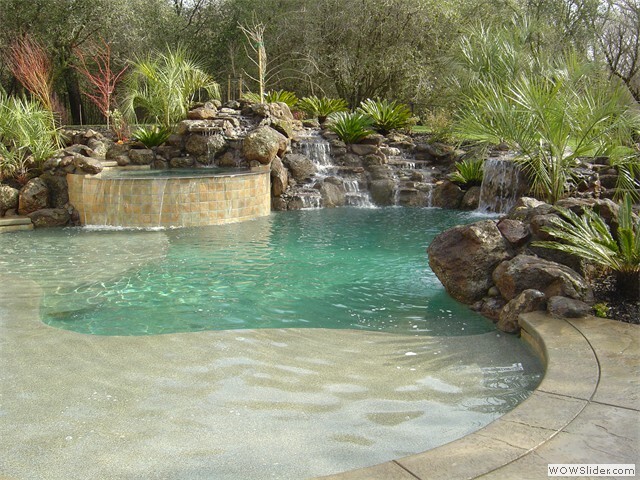 Now, one of the most popular pool construction styles include on-ground and semi on-ground pools in Sacramento. Basically ,these are all inventive, aesthetic and popular choice for homeowners who are striving for an inventive outdoor addition. The out-of-ground style also provides the perfect solution for backyards with construction challenges. Before we go in detail about the on-ground pool styles, let’s define what an on-ground pool is. What Is An On-Ground And A Semi On-Ground Pool? On-ground pools are nowhere near portable or prefabricated pools - so let’s just clear that from the start. Instead, they adopt all the standard concrete pool construction techniques as well as materials. Additionally, they are as durable, reliable and well-designed as standard pools. The only difference in on-ground and semi on-ground pools is their perimeter which is constructed either on the ground or above it - instead of being on a lower level than the earth. The real benefit here is the exposed wall or the wall section that adds certain visual dimension to the poolscape. In most of the cases, on-ground pools are seen as ‘infinity pools’ which are attractive and popular nowadays. The most popular decor styles include tile or stone as well as accents or matches materials that are used in the pool. Why Build An On-Ground Pool In Your Sacramento Home? An ideal solution - The main benefit of on-ground pool construction in Sacramento is the building challenge in the backyard. Most of the homes nowadays either have uneven backyards - or there are walls that are creating a problem. Aesthetics - On-ground pools in Sacramento definitely stand out from the crowd. Not only they will increase your curb appeal - they will also make your property more beautiful. Functionality - Once again, the on-ground and semi-on ground pool types are great for homes with construction challenges, providing functionality in situations where there is a heavily tree-laden backyard or even providing more convenient access for disabled people. 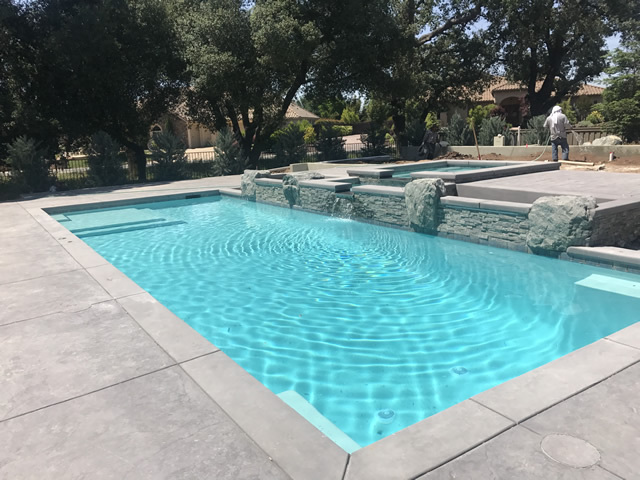 Style - There is no doubt that an on-ground pool done by an experienced Sacramento pool contractor will add style to your property and outdoor space. You can even tailor the design as you like, add some personal flair to the materials and customize your pool before it is actually built. In order to show you the best ways to construct an on-ground or semi on-ground pool in Sacramento is by showing the following styles. The Vanishing Edge Pool - This pool type will help homeowners that are faced with challenges coming from the backyard slope. Additionally, it is a great style to choose if you want a great view - blending the modern with the classic and using a material that can imitate a stone in your patio steps or any other object in your backyard. Semi In-Ground Pool Configuration - Another popular type for backyards with challenging slopes is the semi in-ground pool configuration. Basically, this model provides the ideal solution to a backyard with differences in grade. In order to build id without hauling any fill dirt - the design needs to consider all the patio steps, walls and the dropped deck area. Just like the photo below. Full On-Ground Pool - This pool shows the best blend of aesthetics and functionality. It is tailored to the needs of any challenged owners and provides the perfect height for sliding in the water from any side. The additional decoration with a mini garden accents the natural beauty of the pool and perfectly matches the surroundings. 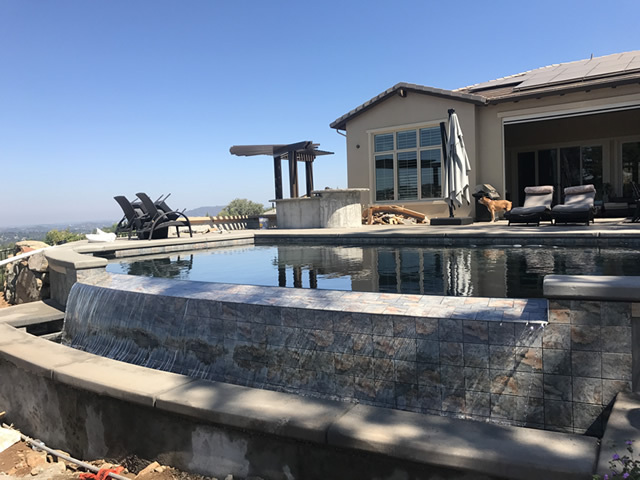 The Faux Infinity Pool- Hiring a Sacramento pool contractor to design a faux infinity pool is another smart idea that saves you from the actual cost of an infinity pool and still gives you amazing function and style. In other words, the water won’t spill over the edges but you will have a pool which side is overlooking a great view, positioned over the incline. To achieve this visual design, the on-ground pool needs to be properly positioned. Just like the image below. The Typical On-Ground Pool - Built 100% above the ground (but not looking like it), this pool is set up in an enclosed section of the backyard. This way, the on-ground feature is not that much present. However, you can see that the pool is practically placed on the ground - but is still large enough for a cool splash and gives you the comfort to rest next to it. 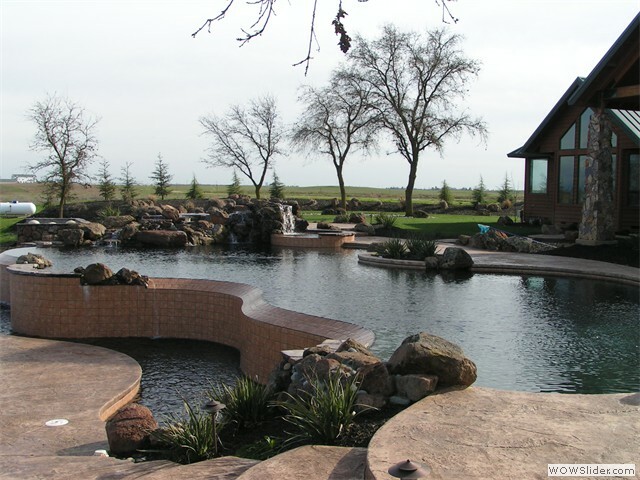 As you can see, there are many good reasons why on-ground pool construction in Sacramento is very popular nowadays. The truth is, it is a cost-effective alternative to typical pools and gives you most of the functionality, style and aesthetics of an in-ground pool without any challenges. However, in most of the cases it is the contractor that makes all the work seem easy and pain-free. 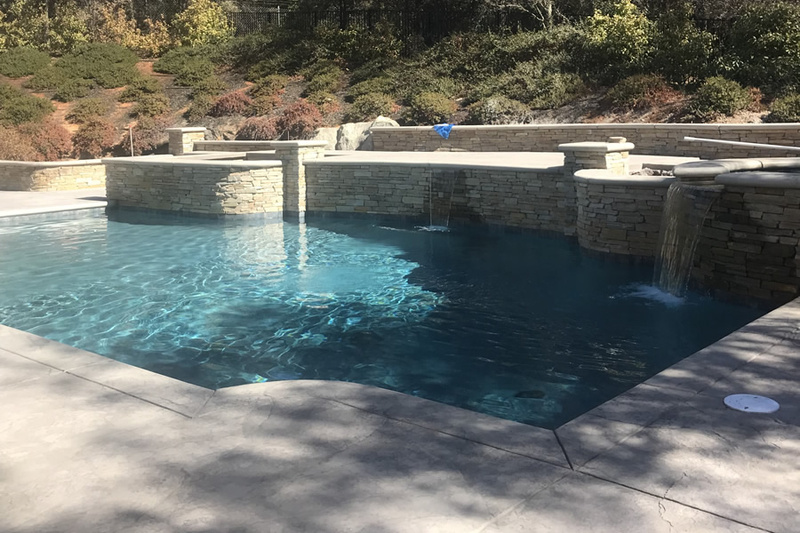 By hiring a Sacramento pool contractor that is experienced and with a vast portfolio of projects, you will know that you are making the right choice. At Sac Pool Pros, we pride ourselves on our experience and satisfied clients. For more information on how we can help you build the pool of your dreams, contact us today via phone or email!